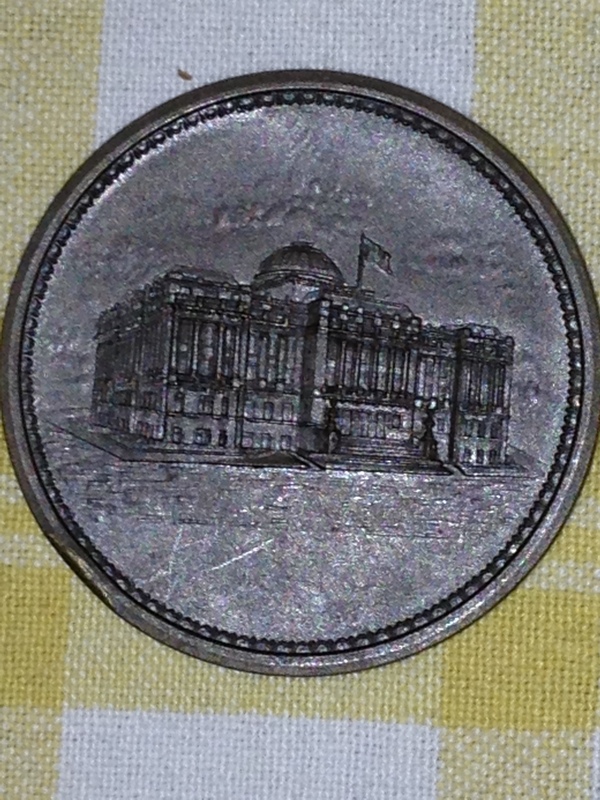 Front of the bronze medal issued in conjunction with the dedication of the new City Hall in 1906. This will be one of my longest posts to date. I’m hoping not to lose potential readers because of the length. I firmly believe that those with an interest in Newark history will actually find it a quick and easy read. This particular piece was taken from The Manual of the Common Council published in 1907 by city council. The “Manual” was a small leather bound book that was published yearly to record the activities of the city government in all its aspects. Revenues, budgets, various commissions , significant projects , such as the construction and opening of a new city hall, were all presented in detail. 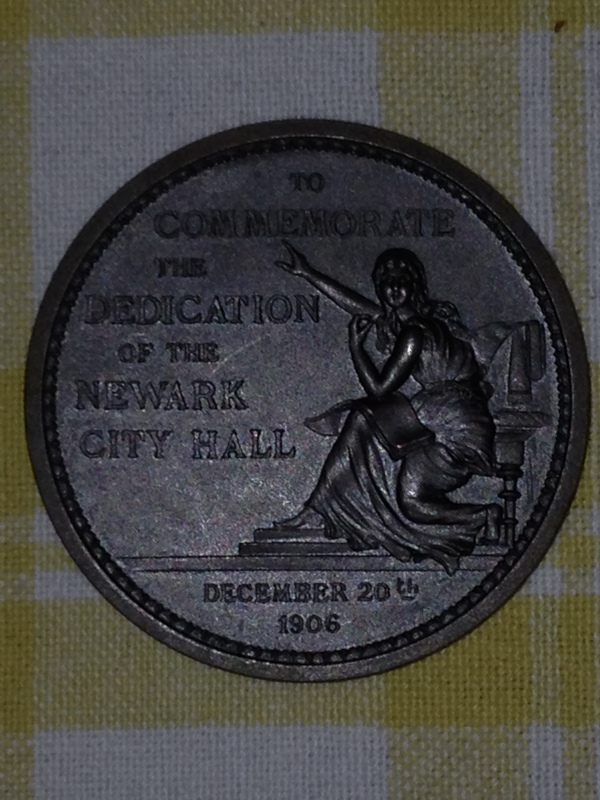 What really caught my attention , in the account of the history of Newark’s City Hall, was the availability and accessibility of source materials dating back to the earliest days of Newark. I would feel correct in the observation that a lot of this early history has become more difficult to access or may have vanished entirely. In 1907, this was clearly not the case. 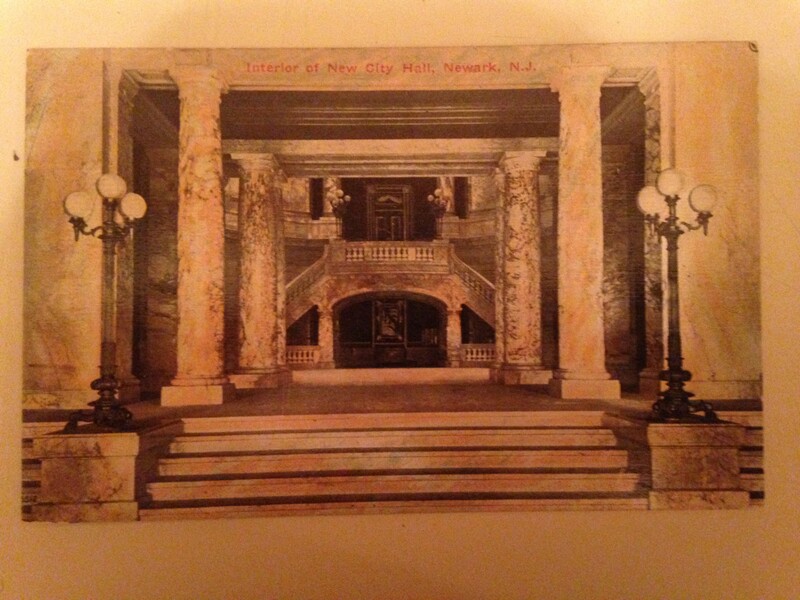 I welcome you to read the entire history of Newark’s City Halls, as published by the council, in their 1907 manual. Organized under the Law of 1887, enabling cities to furnish suitable accommodations for the transaction of public business. Before considering the new City Hall or events which in the last few years have led to the erection of the magnificent structure now occupied as a City Hall, a short history of the buildings of the past occupied by the people of the Town and City of Newark for the transaction of its business may be of interest. Newark was settled in 1666 by settlers who came from Milford, Conn. Although ruled by Governors appointed by the Dutch and English Sovereigns, in local affairs everything was done by agreement. The growth of the town was slow, but notwithstanding this on September 10, 1668, it was voted in the town meeting “to build a meeting-house as soon as may be,” and a committee was appointed to superintend the work. Although the whole town helped in the matter, some one way, some another, it was eighteen months before it was finished. It was 36 feet in length, 26 feet in breadth and 13 feet high. The site of the building was near the spot which was formerly occupied by Engine Company No. 1, now Branford Place and Broad Street. It was called a meeting-house, but was used for church services as well as for public purposes. 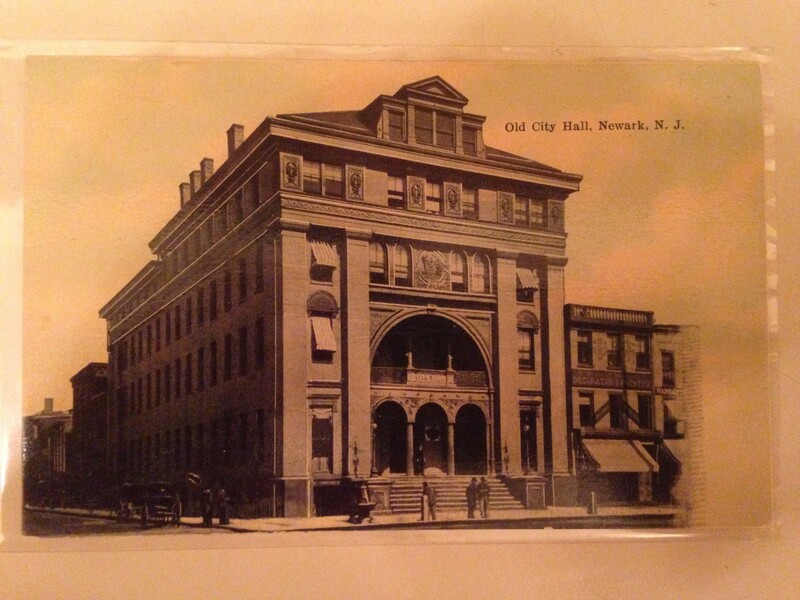 This was the first building in Newark to be used for municipal purposes. In 1675 the building was transformed into a fort, as a place of refuge in case of attack by Indians. The second building was erected some time between the years 1714 and 1716 and was built of stone. It was 44 feet square. Although a small building, as compared with those of to-day, it required great effort on the part of the people to erect it. (This building was also used for religious purposes.) At that time it was considered so large that it was hardly believed that the inhabitants of the town would ever become numerous enough to fill it. It was thirty years before the interior of the building was entirely finished. It stood a little to the north of the first meeting-house. For three-quarters of a century this building was used alternately as a Court House, place of worship and for the transaction of the town business generally. It was in this building that Princeton College, then the College of New Jersey, was founded. In 1755 a suggestion was made to enlarge and repair this building, but it was not until 1774 that a proposition to erect a new and larger building was seriously considered. About that time £2,000 was subscribed, and a site selected on the south side of Market Street, west of Broad Street. The war came, and the matter of erecting a building was dropped for the time being. After the war the building was entirely finished and regularly opened on January 1, 1791. It cost about £9,000. At the beginning of the last century this building was in turn used for religious services, courts of justice and town hall. In the town records it is last mentioned in connection with the holding of the annual town meeting, on Monday April 9, 1810. At a Special Town Meeting, held at the Court room at Moses Roff’s tavern, pursuant to public notice, June 24th, 1811, Aaron Munn, Moderator and Isaac Andruss Clerk. The object of this Special Town Meeting was to take into consideration the propriety of purchasing, with a part of the money arising from the sale of the watering place, a lot of land in the Town plot of Newark whereon to build a Town House. 2d: That a committee of seven persons be appointed, with full powers, to contract for, or build a Town House on said lot of land, in such a way, or manner as they may think best calculated to serve the interests of the Town and that the following persons be the Committee, viz: William S. Pennington, Smith Burnet, Robert B. Campfield, Stephen Hays, Isaac Andruss, James Vanderpool and Aaron Munn. In the Court Room at Moses Roff’s tavern; at Moses Roff’s Court Room and at the house of Moses Roff. From 1819 to 1833 the Town meetings were held in the Session House of the First Presbyterian Church. During this period a few special meetings were also held in the house of Mr. Brittain. Although the Town Hall, which in 1811 it was resolved to build, never materialized, the following extracts from the town records show that the subject was discussed and seriously considered during this period. Newark Annual Town Meeting, for the Township of Newark, held in the Session House of the 1st Presbyterian Church, on Monday, April 11th, 1825. On motion Resolv’d that the consideration thereof, be postponed, and that the subject of said memorial, and also the subject of Building a Town House, be referred to a Committee of Five, with instructions to Report thereon, to a special Town meeting, should they deem it necessary, and Expedient to call one for that purpose, or to the next annual Town Meeting. Special Town Meeting Held at the House of Enoch Bolles October 1st, 1825. The Minutes of the last Annual Town meeting in relation to the Market and also the subject of Building a Town House being also called for and Read both of which were referred to a Committee with powers to report thereon. Whereupon said Committee now Report, Recommending the leasing of said Lot to a Company for the Building of a new Market. As also that application be made at the next sitting of the Legislature for a Law authorizing the raising of money to Build a Town House. RESOLVED, that the Report of the Committee in regard to the Town House be accepted. RESOLVED, that a Committee of Three be appointed to make application to the next sitting of the Legislature for a Law authorizing the Town to raise money for the purpose of Building a Town House; and that Caleb S. Riggs, William S. Pennington and Smith Burnet, Esquires, be and they are hereby appointed on that meeting. Annual Town Meeting for the Township of Newark, held in the Session House of the First Presbyterian Church, on Monday, the fourteenth day of April, at 1 o’clock P.M. In the Year of our Lord 1828. 1st. RESOLVED, that it is expedient to erect a Town House for the more convenient transaction of Town business. 2nd. RESOLVED, that the Town Committee be authorized to borrow any sum not exceeding Ten Thousand Dollars, on the Credit of the Town, and to apply and expend the same, from time to time, in the erection of a Town House upon the Town Lot and joining Stephen Roff Inn after such a plan, and in such a manner, as shall be prescribed to them by a Committee, to be appointed by the Town Meeting for that purpose. Annual Town Meeting For the Township of Newark, was held at the Session House of the 1st Presbyterian Church on Monday, April 13th, 1829, 1 o’clock P.M. The late Act of the Legislature directing the new Town Dock to be taken under the care of the Township Committee, and the appropriating all monies arising from Town Property, to the purchase and repairs of Fire Engines, and for the purpose of Extinguishing Fires-as also the authorizing the raising or borrowing of money for Building a Town House, was read. RESOLVED, to postpone the further consideration of the subject for the present. The annual Town Meeting for the Township of Newark Was held in the Lecture Room of the Third Presbyterian Church, Monday, the ninth of April One Thousand Eight hundred and Thirty-two, at 10 o’clock A.M. RESOLVED, that a town house be built on the Town Lot on Broad street. On June 2 of the same year a special meeting was held at which the committee chosen at the previous meeting reported that they were of the opinion “that owing to the numerous population of the town and its rapid increase, it was advisable to make a division of the town,” such as was suggested in the above resolution, but to carry the measure into effect required legislative aid. Another committee was then appointed to prepare a law to divide the town into two or more districts and to provide for its incorporation as a city. The law was duly prepared, passed by the Legislature, and approved by a popular vote in April, 1836. On April 16, 1836, the Common Council organized in the lodge room of the Newark Academy at 2 P.M. Meetings were afterward held at the Academy, Park House and Market House, and subsequently the Church at 16 Clinton Street was engaged for one year for the use of the city authorities for four days in the week, the Common Council meeting there on the 28th day of May. On July 16, of the same year, after a report by the Committee on Public Buildings, who were appointed to confer with the Freeholders, it was determined to unite with the County in the erection of a public building for use as a Court House and a City Hall. On August 24 the corner stone of the building was laid with appropriate ceremonies. On April 18, 1837, Common Council met in the new Council Chamber in the Museum Building, which had been prepared by a special committee appointed March 27 of the same year. On January 2, 1838, the new Court House and City Hall was dedicated to public use, a large procession of public officers and citizens being formed at the old court room, including Governor Pennington, Chief Justice Hornblower, Mayor Frelinghuysen, judges and members of the Bar. Appropriate ceremonies were performed and an address was delivered by Mr. William Halsey. The Common Council Chamber was not yet finished, so Council still met in the Museum Building, which was destroyed by fire February 10, 1838. Owing to the destruction of the Council Chamber by fire, Council was compelled to use the new hall in the Court House and City Hall Building before it was entirely competed, the first meeting being held there on February 16, 1838. This hall was occupied by Council for a period of ten years. The wants of the community requiring greater accommodations and the location being unfavorable, and in many respects unsuited to the wants and requirements of the city business, all the title and interest in the building was disposed of to the County, the city securing the use of the hall located in the third story of the Library Building for five years, with the privilege of renewal. The last meeting of Council held in the Court House and City Hall was held on August 4, 1848, and the first meeting in the new hall was held on September 1, following. The new room at Library Hall, while in many respects adapted for the purpose, was without the necessary accommodations for the various committee and city officers. This inconvenience was seriously felt, and mainly on this account the attention of the Council was early directed to procuring a City Hall which would supply the necessary accommodations and over which they could exercise exclusive control. Better market facilities were necessary, and after much consultation and argument, it was determined if the proposition could be carried into effect, to secure the right to erect a new market building over the Morris Canal. On the 5th of September, 1851, the Committee on Markets reported and a resolution was adopted to the effect that they be authorized to cause an agreement to be made with the Morris Canal and Banking Company for the purpose of using the space over the canal, between Broad and Mulberry streets, according to the terms mentioned in their report. On the second of April following a similar resolution was adopted and the terms being agreed upon, the agreement was ratified and the Market Building, over the canal, was erected during the years 1853 and 1854, containing on the Broad Street front a second-story for a Council Chamber, various committee rooms and offices, a tower for a fire alarm bell, and on the east end departments for a police station and a city prison. The new Council chamber was formally opened May 31, 1854. The increased accommodations afforded by the new City Building, though far exceeding anything theretofore possessed by the city, proved inadequate, and it became manifest that some more commodious building, one in which every department of the city government could be supplied, with the necessary means of carrying on their appropriate work, and in which the public records could be secured, would have to be provided, and it was finally decided to proceed forthwith to the erection of a new City Hall, station house and city jail. After much consultation and deliberation, it was finally determined to purchase the hotel known as the McGregor House, situate at the corner of Broad and William Streets, believing that by a judicious system and plan of alterations and repairs it could be converted into a City Hall possessing al the requisites of such a building, at a much smaller outlay and expenditure of money than would be required by any other plan. The building had been erected in the years 1835 and 1836 by a company incorporated as “The President Directors and Company of the Mechanics’ Hall Association” as a public house. The building did not prove to be a profitable investment, and for many years remained partially, if not wholly, unoccupied. Just previous to its purchase by the city it was occupied as a hotel. After coming into possession of the building and grounds the city commenced the erection of a police station and city prison and the alteration and remodeling of the City Hall. The first Council meeting in the new hall was held September 21, 1864. This building, altered and enlarged from time to time, remained the official home of the city until the occupation of the present building. It was anticipated that the building would be large enough to allow for the future growth of the city for fifty years or more, but for a long time the city had been obliged to rent offices and buildings for the accommodation of its various departments and was never able to find spacious room and convenient quarters. Resolved. That the Mayor is requested by this Common Council to take suitable action, pursuant to the laws of this State, looking to the erection of a new City Hall Building, and to communicate with this Common Council thereon at his Honor’s earliest convenience. In September of the same year, in accordance with this resolution, the Hon. James M. Seymour, then Mayor, appointed Judge Kirkpatrick, Hon. Gottfried Krueger and the Hon. James E. Howell, Commissioners to locate, erect, furnish and equip a new building for municipal uses, which appointments were confirmed by the Common Council. Judge Kirkpatrick died in May, 1904, and Thomas Cressey was appointed to fill the vacancy. The Commissioners qualified and held their first meeting on September 9, 1899. The heads of each of the City Departments were requested to report to the Commission the amount of floor space and other accommodations that would be required for the proper transaction of the public business, but it was not until the middle of June, 1900, that the Commission was able to get together the necessary information upon which they might act, and it was not until October, 1900, that it was possible to formulate any sort of tentative ideas for the construction of the building. During this time the Commissioners were considering several sites for the location of the building. On November 17, 1900, the present site was selected and the first piece of property bought. The selection of the site was necessary before the character of the building could be determined. The latter part of 1900 and the early part of 1901 were consumed in the work of formulating the general plan and character of the structure, also in preparing a prospectus from which the architects might design the building. There was free competition, and on the first day of June, 1901, fifty-seven plans were submitted by as many architects. The Commission employed Prof. F.W. Chandler, head of the Architectural Department of the Boston School of Technology, as consulting architect, and with his aid and advice the Commission selected five plans of the best examples of buildings suited to our needs. These were furnished by O’Rourke & Dubois, W.P. Tubby, Ackerman & Ross, of New York, J.H. & W.C. Ely, and Jeremiah O’Rourke, of Newark. Messers. Ely had as collaborators Messrs. Mowbray and Uffinger. Prof. Chandler furnished the Commission a criticism of each of these five plans and copies of each were furnished to the architects and a new competition was ordered between the five, which resulted in the adoption of the plans furnished by Messrs. J.H. & W.C. Ely, on November 20, 1901, and from their plans the building was constructed. After the plans had been adopted it took several months to procure the details from which the contractors might bid, and considerable more time for the contractors to make up their estimates, so that it was not until the 15th day of August that the actual construction of the building was begun. After advertising for bids, the contract for the construction of the building and boiler house, except heating and ventilating apparatus, electric wiring, elevators, gas and electric fixtures, was awarded to the E. M. Waldron Company, July 15, 1902, for the sum of $1,088,192.00. This does not include architects’ fees, the salaries of the Commission and other expenses of administration. There was a bond issue of $1,500,000.00, and the Commission received from the sale of unused property a little over $800,000, and for loans and interest about $20,000.00. The building was formally opened December 29, 1906, with appropriate exercises. Prayer was offered by the Rev. David R. Frazer and the Benediction pronounced by the Rev. Isaac P. Whelan. Among the speakers were the Hon. James E. Howell, President of the Commission; Hon. Henry M. Doremus, Mayor; Hon. Jacob Haussling, Mayor-elect, and Alderman William Pennington, Chairman of the Public Buildings Committee. The drawing of City Hall is from the 1902 Manual of the Common Council after the design of the building had been chosen. 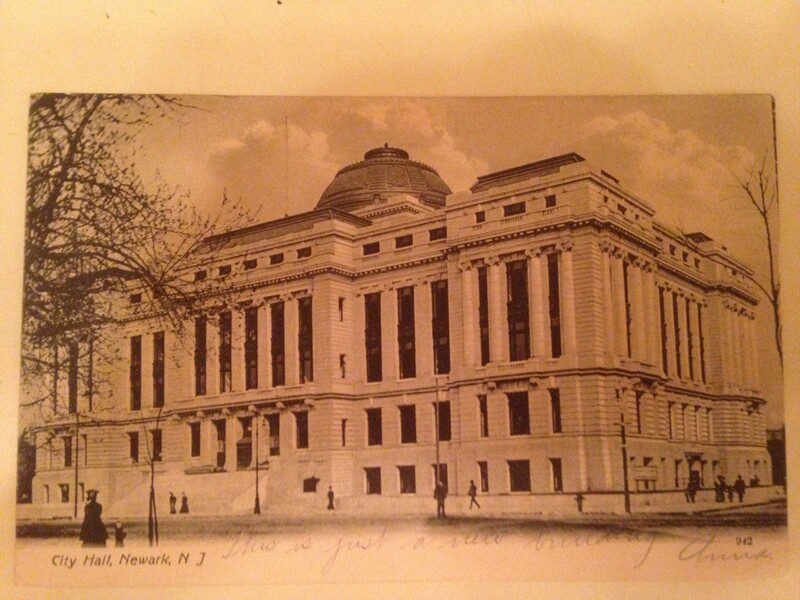 The post cards are of the new city hall and the old city hall. The view of the common council chamber in the old city hall is also from the 1902 Manual. The two interior shots, of the new city hall, are from the 1907 Manual of the Common Council showing the council chamber and the rotunda. The medal and invitation are from opening of the building on December 29, 1906. In love with this site, thank you for your work. This was a great entry. Do you know if there were any manuals for 1839? can you please send citations. The information came from a Newark City Council Manual. The year was 1907.